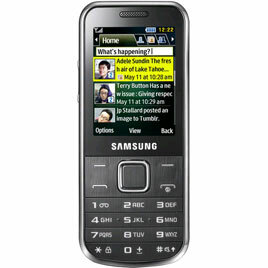 Samsung re-introduce the latest candybar phone design. This time, Samsung introduced a new concept on the Samsung C3530, a phone for the middle class with a casing made from high quality metal material. Samsung C3530 is only 11.9mm thick comes with 2.2 inch QVGA TFT screen, Quad-Band network support GSM / EDGE, MP3 player, FM radio with RDS, 3.2 megapixel camera, microSD slot up to 16GB, 3.5mm audio jack, and access to Facebook, Twitter, GoogleTalk and Parlingo.